Roll-Kraft recently hosted its annual regional tube and pipe and roll forming training seminars in Mentor, Ohio. This year’s event was attended by more than 60 companies from all over the United States, Canada, Mexico, and as far away as Korea. Many companies sent several attendees. Both seminars included tours of Roll-Kraft’s state-of-the-art corporate facility in Mentor. Seminar attendees included operators, maintenance and quality personnel, supervisors, and management of varying experience levels in the tube and pipe and roll forming industries. Robert A. Sladky, Vice President of Tube Mill Engineering for Roll-Kraft, was the organizer of the event, as well as one of the speakers for each of the two programs. 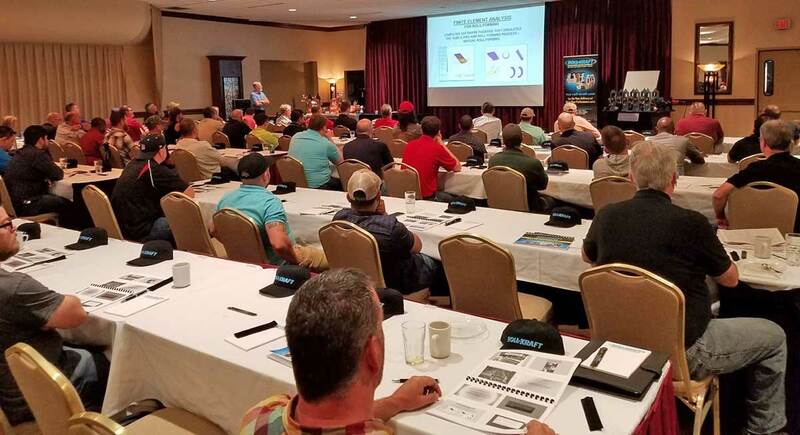 Sladky said, “Demand for our regional seminars, as well as for our in-house programs at customer locations, has dramatically increased over the past two years, and attendance continues to grow, with programs booked well into 2019. In this day and age, it is encouraging to see new businesses starting up, instead of shutting down. In past years, attendance at tube and pipe training sessions offered by Roll-Kraft had outnumbered the roll form training sessions. However, 2018 has seen a more equal demand for training in both industries. Roll-Kraft’s training programs – both regional seminars and in-house training sessions – focus on developing a standard for all to follow in the areas of mill integrity, alignment, setup, and tooling maintenance. In addition to giving the audience an understanding of the equipment, tooling, and processes for their industry, the primary focus is to get all employees “on the same page,” performing their duties in a predictable, repeatable fashion in order to minimize changeover and down times, while at the same time increasing production and profits. This year’s event incorporated even more interactive videos in each of the two presentations. These videos, along with numerous technical publications, can be found on Roll-Kraft’s website, the most comprehensive, informative resource in the industry. Roll-Kraft has its headquarters in Mentor, Ohio, and it maintains other facilities in Lombard, Illinois (Chicago Roll Company); Houston, Texas (Roll-Kraft Texas); and Ontario, Canada (Roll-Kraft Ltd.). Calls to the company’s main line, (888) 953-9400 or (440) 205-3100, are greeted by a live operator who can assist callers in quickly reaching a technician, engineer, or sales staff member who can provide immediate assistance. The company’s fax number is (440) 205-3110. Learn more about Roll-Kraft products and services by visiting roll-kraft.com and see more technical videos on the company’s YouTube channel. For easy and immediate contact with Roll-Kraft that transcends time zones and working hours, the website features an easy-to-use contact form.